Hong Kong KitChee FC – Arsenal on Tour 2012 | "It's all about the Arsenal"
There I was Sunday morning; sun shining, tuned into ESPN to watch Arsenal play another Far East tour match and full (well half English) in preparation for match. 10am and the Arsenal match now on ESPN and first pictures are of the AFC substitutes walking around the pitch at the Hong Kong National Stadium. The stadium holds around 40k people and it’s looking like it is going to be a full house. Some good support for Arsenal inside the stadium, many cheering the players on their way to the bench. On the down side Stewart Robson is once again co-commentator… The two teams come out of the tunnel with Djourou captain. Arsenal team to start : Szczesny, Djourou (c), Miquel, Eastmond, Gibbs, Diaby, Coquelin, Oxo, Walcott, Ryo, Chamakh. There is the obligatory remark from commentator “its been seven years since Arsenal last won a trophy”. Early pressure from the home side who looked to be throwing the kitchee sink at Arsenal. Good early chance for the home side with S13 just getting a hand on the ball, could have been 0-1. I have noticed recently how when Theo puts a sprint on that when he needs to stop he does so very slowly, maybe looking at ways to stop hamstring injuries. Kitchee took the lead 1-0 after 7 mins… Good move on their part, not such good defending on Arsenal’s part. Miquel poor pass to Diaby where the ball is intercepted and a good pass leaves Miquel flat-footed and Lopez slots it home nicely for 1-0… Theo had a decent effort on 11 mins only the shot went wide. Chamakh should have scored 0n 17 mins only managing to hit his shot straight at keeper. Arsenal came forward, the ball was lost by Diaby, yet he won the ball back and slotted a nice little pass to Theo who slid the ball into the net, to make it 1-1.
and a nice little touch on the celebration also for Theo. Great break from Arsenal, Diaby winning the ball and running the length of the pitch to get ball back from Chamakh and fire his shot wide, more to do with poor pitch. I thought the first half was another good work out and good to see the home team making a fist of the game. However, at times I also thought the team were looking totally un-interested and showing a lack of respect to the home side. The players that played in the first half though are NOT the team Arsenal will play in the Premiership, though you feel SR thinks it is. Arsenal (second half): Szczesny, Jenkinson, Santos, Djourou (Bartley 70 mins), Miquel (Yennaris 70 mins), Oxlade-Chamberlain (Arteta 70 mins), Aneke, Coquelin (Song 70 mins), Walcott (Eisfeld 70 mins), Gervinho, Afobe. Afobe 2.0 hit the post after good work from Gervinho it should have been 2-2. Walcott had another good chance to score, then Afobe 2.0 should have scored from a wicked Oxo cross. On 77 mins Gervinho who looked well lively throughout the 2nd half, took on two defenders, rolled the ball back for Eisfeld to stroke his shot nicely into the net for 2-2, a very cool finish for what looked an easy goal. Having watched the entire 90 mins I quite enjoyed the game. The crowd seemed to be up for it. These are only friendly matches for Arsenal and the main object is to get the squad the fit and ready for the Premiership season. 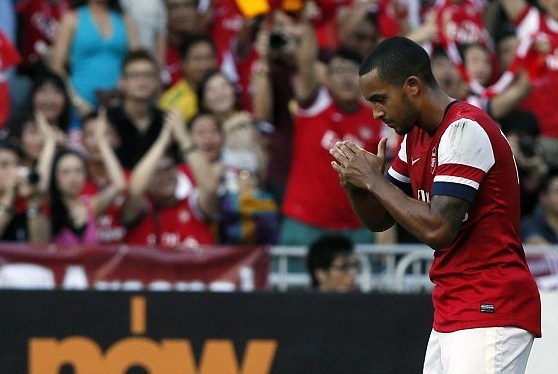 I thought just like the first half KitChee gave Arsenal a good work out and that’s really what we want. If we had gone to Sweden or alike and played three third division sides and won each of them 10-0 would that have done any good, just so people could tweet we’ve scored a lot? defensively we looked fragile, especially in the first half. In the second half not so much because we were not challenged. Defensively we have a lot of work to do as a unit to do much better. 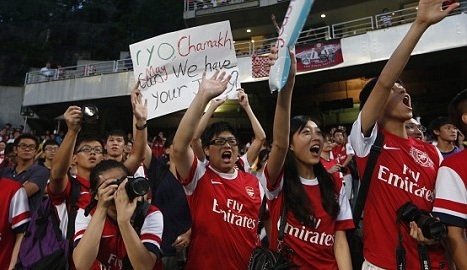 Arsenal leave the Far East behind having made more freinds and leaving behind some great support. It was confirmed today by Arsene Wenger that Jack Wilshere will not feature in the team until October. No more than expected and best to give the lad all the time he needs to make he is fit and ready. The squad now has fourteen days until the last pre-season game in Cologne. Hopefully in this time maybe two or three new players would have been signed and three or four players would have left. I have heard rumours that maybe a behind doors match or two will be arranged.